Item288 - Perth 18. Plan from actual survey of Township of Perth showing Lots, Streets & Lakes bounded by Perth Water to South, Ellen Street to North, Mt Eliza to West & Swan River & Hierrisson Island to East. Drawn by A. C. Hillman, 1838 [scale: 10 chains to an inch]. Item289 - Perth 18a. Plan of Perth Township showing Lots, Streets & Lakes from Mt Eliza in West to Walters & Claise Brooks in East, Lakes Henderson & Poulett to North & St Georges Terrace in South. Unsigned, probably Hillman, 1838 [scale: 6 chains to an inch]. Item290 - Perth 13. Plan of Lots, Lakes & Streets in area bounded by Goderich Street in South, Lake Irwin in West, Edward Street & Lake (North) & Claise Brook in East. Plan to accompany Sections of Levels for drainage of Lakes by A.C. Gregory, 1854 [no scale, Tally No. 005747]. Item291 - Perth 18A. 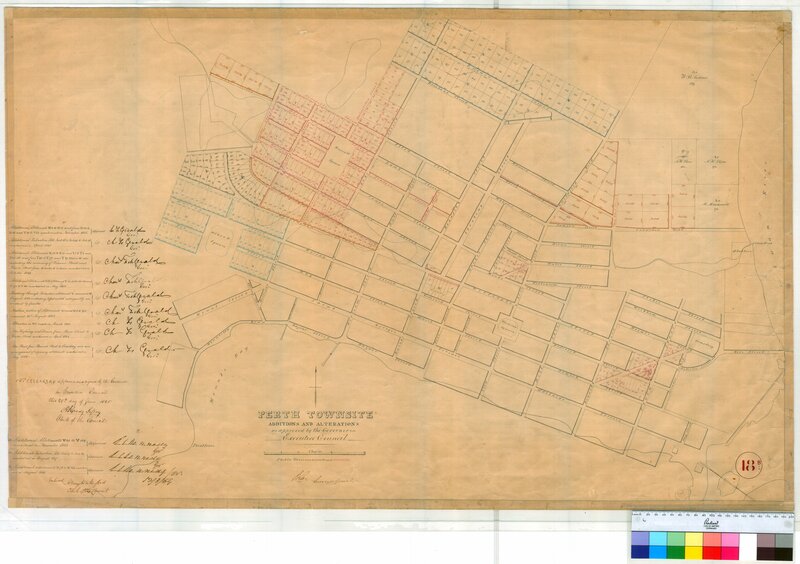 Plan of Perth Township showing Lots & Streets between Milligan & Pier Streets & Swan River to Murray Street, by A. Hillman [scale: 2 chains to an inch, Tally No. 005752]. Item292 - Perth 18B. Plan of Perth Townsite showing Lots, Streets & Additions & Alterations bounded by Charles Street, Mounts Bay Road & Adelaide Terrace. Bulwer Street & Swan River (Claise Brook) unsigned, possibly Roe, undated [scale: 6 chains to an inch, Tally No. 005653]. Item293 - Perth 18b. Plan of Perth Townsite showing Lots & Streets bounded by Barrack Street, Howick Street, Pier Street & St Georges Terrace [Tally No. 005754]. Item294 - Perth 18C. Plan of Perth Townsite Lots between Charles Street & Swan River (Claise Brook) & Bulwer St to Bazaar St (duplicate of 18b) with additions & alterations [by W. Phelps?] undated/unsigned [scale: 6 chains to inch, tally No. 005755]. Item295 - Perth 18D. Plan of Perth Townsite showing Lots & Streets between Brisbane & Bazaar Streets & Albert Square and Swan River (Claise Brook). Additions & Alterations, undated and unsigned [scale: 6 chains to an inch, Tally No. 005756]. Item296 - Perth 18E. Plan of Perth Townsite showing Lots & Streets between Melbourne Street, Trafalgar Road & Causeway - position of Lakes Henderson, Irwin Kingsford & Sutherland. A. Hillman, Assistant Surveyor, 1845. J.S. Roe 1834 and M Fox [scale: 6 chains to an inch, Tally No. 005757]. Item 292 - Perth 18B. Plan of Perth Townsite showing Lots, Streets & Additions & Alterations bounded by Charles Street, Mounts Bay Road & Adelaide Terrace. Bulwer Street & Swan River (Claise Brook) unsigned, possibly Roe, undated [scale: 6 chains to an inch, Tally No. 005653]. Perth 18B. Plan of Perth Townsite showing Lots, Streets & Additions & Alterations bounded by Charles Street, Mounts Bay Road & Adelaide Terrace. Bulwer Street & Swan River (Claise Brook) unsigned, possibly Roe, undated [scale: 6 chains to an inch, Tally No. 005653]. Confirm Item Request: Perth 18B. Plan of Perth Townsite showing Lots, Streets & Additions & Alterations bounded by Charles Street, Mounts Bay Road & Adelaide Terrace. Bulwer Street & Swan River (Claise Brook) unsigned, possibly Roe, undated [scale: 6 chains to an inch, Tally No. 005653].